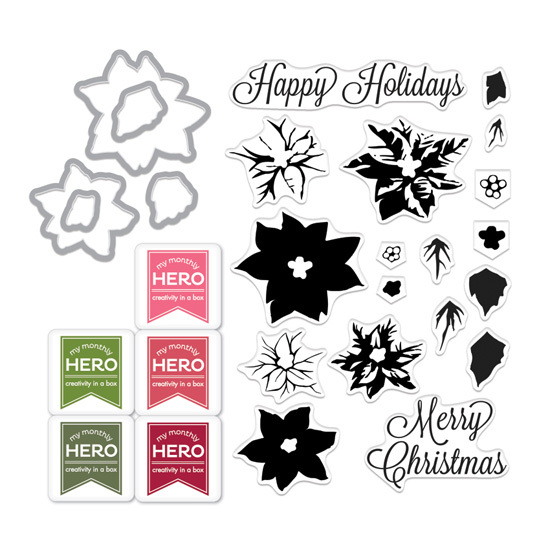 Hero Arts now has kits called My Monthly Hero Kit! And the first one is perfect for Christmas cards and tags and is quite versatile. It includes stamps, dies, and 5 inks in cube size (my favorite size) for $29.99. You can also find more information about this kit on the Hero Arts blog. But the perfect way to see it in action is a short and really fun video by Libby Hickson for Hero Arts. I love versatile. I need to be able to use a product way more than just a few times. And I don't want to be bored making the same card over and over. So when Hero Arts sent me this kit last week, I set out to use it in a variety of ways. Layered the larger of the poinsettia images using Ranger Distress Inks onto watercolor paper, and lightly painted with water after each layer, adding in some yellow with a Tombow marker. I wasn't trying to align the layers -- was going for a loose look. Added white in the centers with a gel pen. Flicked some white paint, added the sentiment, and some white enamel dots. Oh, and if you look closely, you'll see the impression of the back of a rectangle die. Can't get much easier than this. 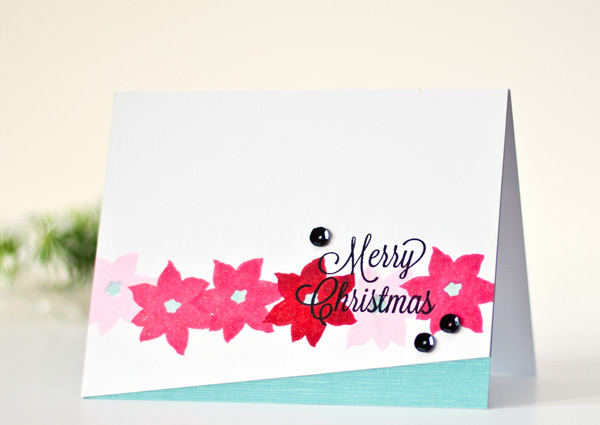 Stamp a row of the solid flower, with Wink of Stella glitter pen over the flowers. Here I used the stamp set to layer the flowers, following the graphic that Hero Arts includes in the kit. Easy to align the flower layers -- just use the center of the flower as your guide. Then die cut. 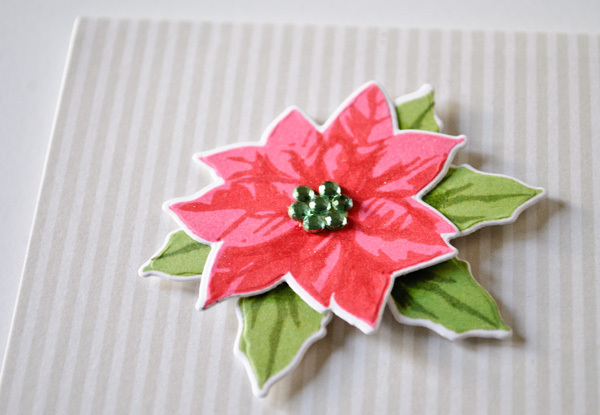 Popped up the poinsettia with foam tape onto a card covered with patterned paper. More of Wink of Stella glitter pen on the flower and leaves. Added an extra strip of the patterned paper on cardstock right under the sentiment. The sentiment is from another Hero Arts set, Christmas Crystals, which was released last year. This is post is already long, so I'm not including a supply list (also because most of the supplies are from the kit), but if you have any questions, ask away! And now let's go see what these fabulous artists made with the kit! MOOD WHEN DONE = Christmasy! My fav has to be the watercolor card. I love how it turned out! Absolutely GORGEOUS, Joan!! I love to see the very different ways you used the kit! My jaw is on the FLOOR on that watercolor card - you are amazing! 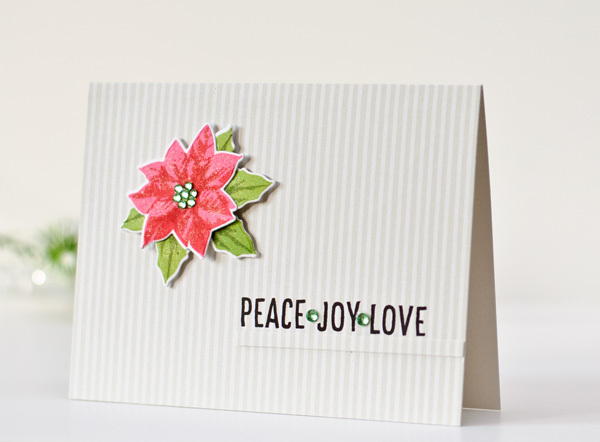 Great job - love the water colored poinsettias. Awesome cards!! Thanks for showing three wonderful ways to use that stamp set!! 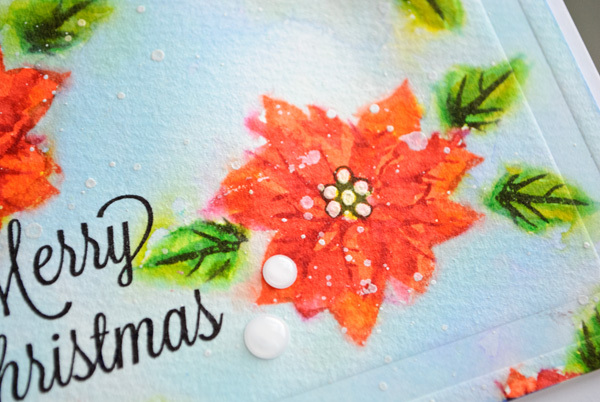 Beautiful cards - especially love the watercolored one! Aah ....Joan you've been too long off my list of Bookmarks....what a joy to read your blog all about stamping and how you got started....you still are, and always were, a breath of fresh air. We used to be 'together' on Gingerstamp if I recall correctly. I haven't been able to get on there for a long time. You are now firmly on my list for a good read, good cards and a lot more! awesome to reconnect!! Hello! I'll be across the pond soon! All of your cards are stunning, but I absolutely LOVE the last one on the striped paper. GORGEOUS!!! These are AMAZING Joan! The wink of stella on the card is just gorgeous!! You did awesome makes with the kit! 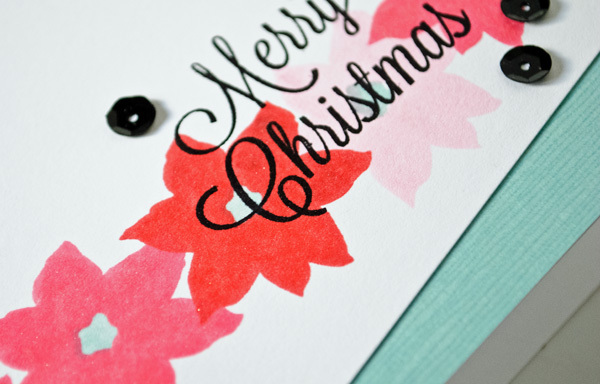 You are really getting back in the groove with stamping and companies! You Go Girl! 3 AMAZING WAYS!!! WOW... that watercolor card is just gorgeous. 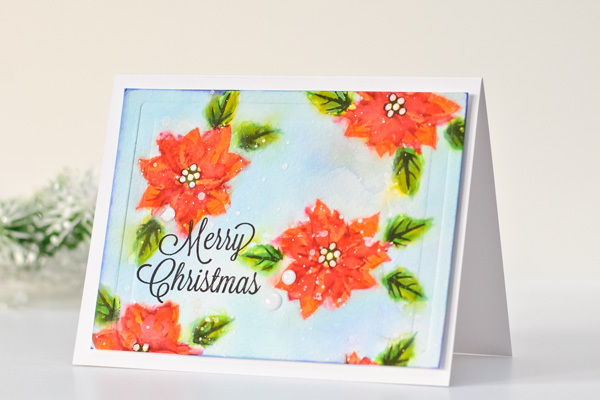 The stamping in the row is so cool and the layering one is fantastic! I love your works! Libby's video was really cute! Three great cards, Joan!